From LinkedIn to Forbes, list after list shows data and Tableau skills as must-haves for hiring managers in 2017. The problem is that 36% of US managers from a recent PayScale survey say new grads lack data analysis skills. The good news? As a student you can gain a competitive advantage by learning these skills for free with Tableau. 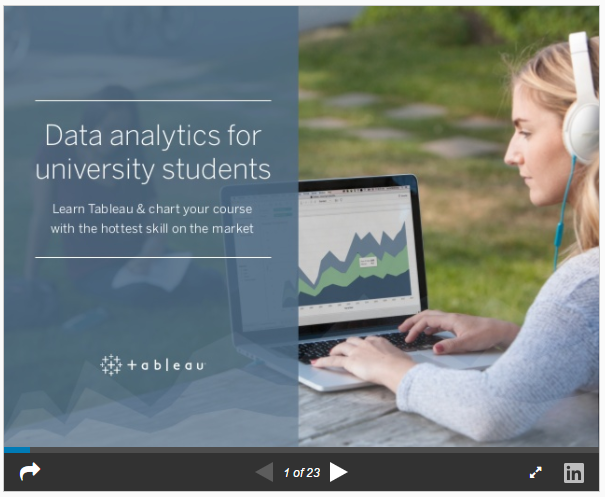 Check out our new Data Analytics for University Students guide brought to you by the Tableau Academic Programs team to learn how to get started. You’ll hear from students who learned Tableau and how it’s helped advance their careers, get inspired by student-made vizzes, and learn how to build your data portfolio on Tableau Public. Then request your free student license of Tableau and try it out for yourself. Check out the SlideShare now to get inspired. Are you a student or an instructor? Full-time students get a free one-year license of Tableau Desktop through Tableau for Students, and instructors can get a free one-year license and student licenses should they decide to use Tableau in the classroom.